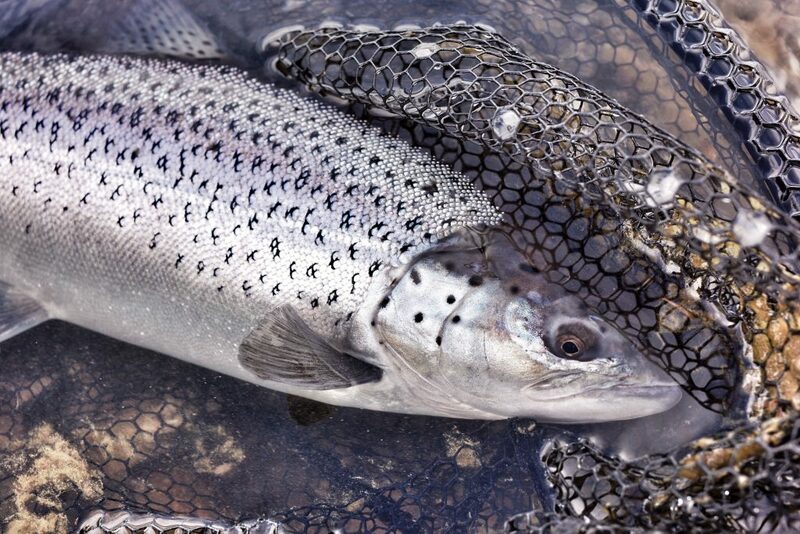 I have never really been excited about trout – how hard can a trout pull? I have fished for them in the past and plucked some very pretty looking fish from a stream, but they tend to skip back over the surface to you without any resistance. I have had to eat those words, but to be fair they tasted pretty good; especially if you travel down to the Rio Grande to find out exactly how hard they do pull. My first ever sea trout was a lovely little fish from the River Spey last June which, after a bump in the dark, gave a spirited tussle on the DH spey rod. I was delighted with it. Their South American cousins are quite a different animal. This latest Argentinian adventure began in late November 2018, when I realised I had leave to take. With the new policy of “use it or lose it”, I wasted no time in making the phone calls and sending the emails. The choice was between the Rio Grande or Gallegos. 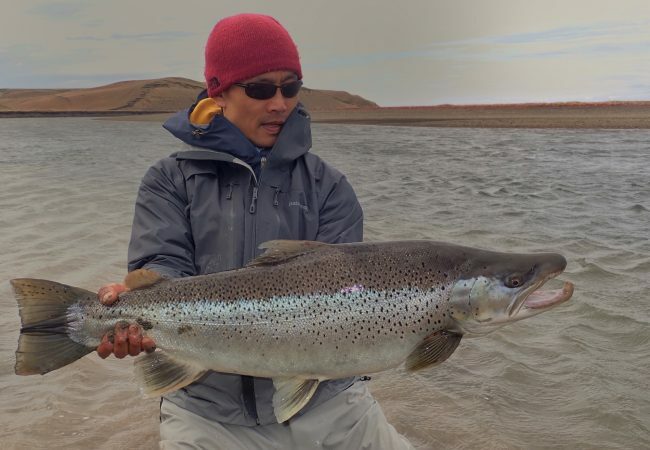 Many messages and conversations later, I decided – my choice endorsed by a few friends in the know – to Tierra Del Fuego and fish the Rio Grande. Why would anyone pay this much to catch trout I questioned myself? Freshwater fly fishing is not a hobby that can be indulged cheaply, but as my friends said, I was throwing my money in the right direction. It seems that every time I fly to Buenos Aires, the weather in London will give me a frosty send off. A day and a half later the southern hemisphere gave me a warm welcome and at 18 degrees, the wind did not feel that bad when I landed at Rio Grande International Airport. Federico was there to meet me in the arrivals hall – despite the lack of any labels on my clothes, and no rod tube – I still looked like an angler! When I mentioned the lack of wind, he smiled and told me to wait. The city of Rio Grande is not known for its architecture. Once out of town, the scenery changed dramatically. The endless sky and pampas, different shades of earth tones. Without trees for shelter, the short grass shimmered as the wind pushed it around. The hills, sculpted by the breeze, leaned over the river, the restless waters flecked with white crests, and rippling with waves. After a bumpy ride the coach stopped outside our lodge.The wind was really pushing hard now, carrying the chill of the southern Andes to the Atlantic. The lodge was set atop a hill, overlooking a meandering silver ribbon in the valley, with snow capped peaks to the west. Our nearest neighbours were over 10 miles away. I was beginning to enjoy the sense of isolation from the rest of the world, but this was quickly dispelled when our lodge host Mariana gave me the WiFi password. 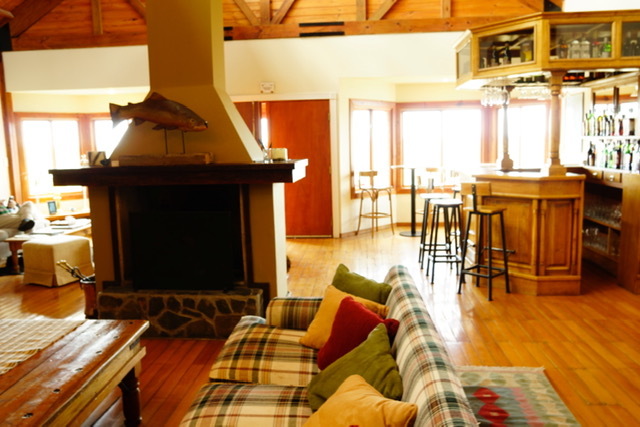 The lodge was well appointed, with plush sofas, cushions, underfloor heating, heated wader room and an open bar. My room was comfortably furnished with plenty of space to spread my kit about. The ‘gift store’ stocked a few jackets, shirts, caps, as well as a small selection of tippet, flies and other bits and pieces a forgetful angler might have overlooked. Bring everything and bring spares, the guides are very helpful and do carry their own tips, flies etc, but do not be reliant on their kit. I did end up acquiring a second puffa jacket as I was getting chilly in the evening session. The cold has a habit of slowly stripping away your focus from the fishing to beers and what might be for dinner. The fishing is organised in pairs, and you fish with the same buddy for the week, with a change of guides and beat each day. The morning session kicks off at 8am after a decent breakfast. 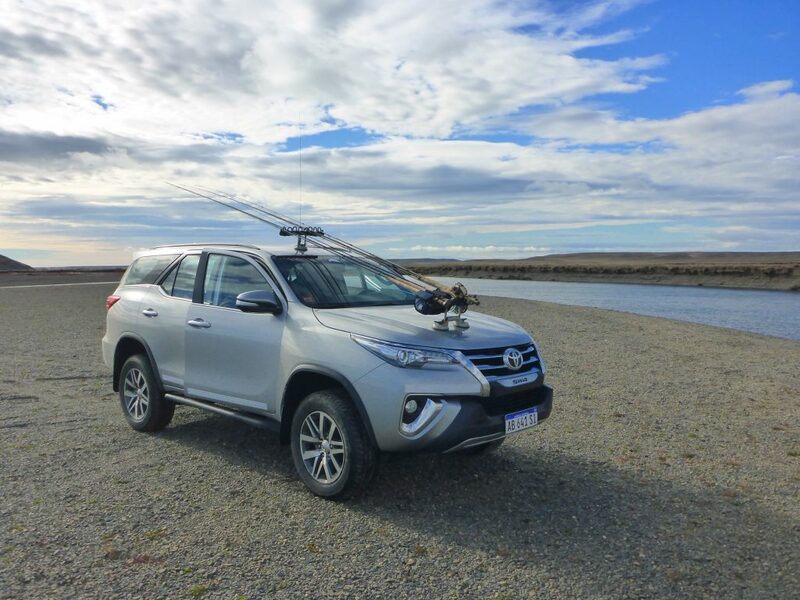 I travelled by Hilux pick up – my personal favourite fishing wagon – to the beat. The beats are picked by the guides and fished in rotation, sharing the water with La Villa, Kau Taupen, Villa Maria, and Despecida lodges. It might sound quite crowded, but there is enough water to go around. 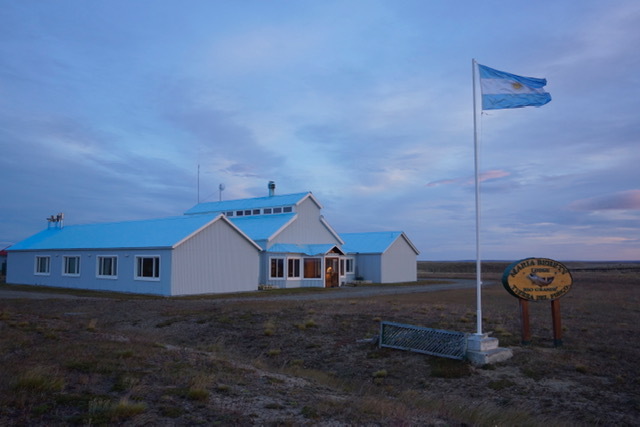 In fact the lodge controls the lion’s share of water on the left hand bank of the Rio Grande as it empties towards the southern Atlantic. After a morning’s fishing you are taken back to the lodge around 1230 for lunch. The guests are greeted with delicious canapés and starters at the bar, and then an exquisitely prepared luncheon. The hardest thing is to control your eating, as I find it very difficult to sleep after a heavy lunch! Siesta time is between 2-6, with tea at 6 and then an evening session between 7-11pm. Like all Latin cultures, dinner is late – around midnight – and then you could either spend the evening telling fishing stories at the bar until the early hours, or catch up on rest. Eat, sleep, fish – repeat. What’s not to like? Tales are told about the wind, you see and hear it on the videos, but nothing prepares you for its intensity. Standing in river the water wraps her chilly embrace around your legs, the air bullies you into submission with her gusting and buffeting. This elemental assault on your senses can melt your confidence; that is why you have the guide – to steady you. He tells you where to cast and how make the wind your friend. He will haul you up a steep bank as you play a fish, grab you before you take a dunking, net the fish, change the fly, tell you tall stories about how cougars eat tourists, and generally provide excellent waterside banter and company. Before the trip the wind did worry me, but even for a relatively inexperienced caster, it was manageable. I could get as much line out as I needed to, and in some cases fished too long a line, which certainly cost me pick ups. The important factors in this type of fishing is cast angle, depth, fly speed, and consistency of the presentation. And once I got this in my head, I started to fish, rather than be told where to put my fly. The constancy and repetition is rather like prayer, meditation, living in the moment, alert for that tap, bump or savage wrench. Some of the takes were gentle, a loss of tension in the line, a couple were brutal with my clicker reel spinning suddenly and bruising my knuckles; the river god chastising me for not paying attention. And the rest were the standard tap, lift and raise the rod to set the hook. When I travel for fishing I am usually over-rodded – bringing at least 6 sticks, not on this trip. I only brought 2 DH and a SH 8 weight. On another equipment point – be advised by the lodge what sort of line set up is required – I brought a skagit and scandi line set up with a range of different tips. The tippet is invariably 16-20lb fluorocarbon. The recommended flies are widely known, but a word of caution – check the quality of hooks. I bought a selection of flies from size 2-10 and in different weights. I lost 4 fish because of hook bends.The flies I tied myself were tied on carp hooks and they held firm, and did not straighten. The patterns are not difficult to tie – and I find a few hours at the vice a couple of weeks before adds to the excitement, and the satisfaction of catching them on your own fly is immense. The fishing was spectacular. They only count fish over 3lb. 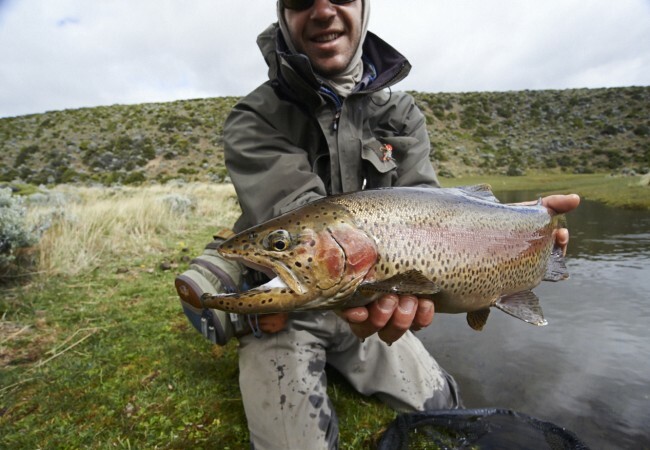 Lots of little fish were caught: feisty resident brownies – bronze jewels, spotted red and black; rainbows – polished chrome slender and delicate; both eating flies on the dangle or swing, but after a while the novelty wears thin. The main feature is the sea run brown, and there is no mistaking one on the end of your line. This is unlike any other type of fishing that I have experienced. They pull so hard, bending the rod, creaking the lacquer, and when they fight with the current, there is no certainty of success. I had 2 huge fish wallowing in the shallows, with the guide tutoring me on how to use the current to beach the fish; the scratch of the gravel on their bellies angers them so much they thrash and roll, wrapping the leader round their bodies and the inevitable happens – the hook falls free. There is nothing worse than seeing a big fish that should have been netted escape – heartbreak. But with pain there is also joy – a 19lb caught from a deep pool on an ugly flashy bugger – one of my own: I was instructed to cast my skagit and T17 upstream 20ft out, mend 3 times and feed line, felt it snag some weed and lifted. I saw a fish jump under my feet and thought how that was incredible that they were not spooked by my presence. And then the reel started to move. all this happening at the same time as a GO PRO was filming me looking bewildered, surprised and nervous. We all get the shaky legs, sweaty palms when we feel the rod come alive and kick in your hand, and then see a silver missile launch clear of the water. It sounds like someone has thrown a pig in the river when it lands. In that current, every fish feels huge, every run sets your nerves alight. When the guide gave the thumbs up, I was 20 ft from the edge of the bank, guiding the fish back to the net on a long line, I felt the tension melt from my shoulders, threw the stick and ran to the river to claim my prize.I gazed in wonder at the brute of a fish – stocky, short in length but muscular with a satisfying heft, its chrome flanks covered in black spots, and a mouth with an angry kype. 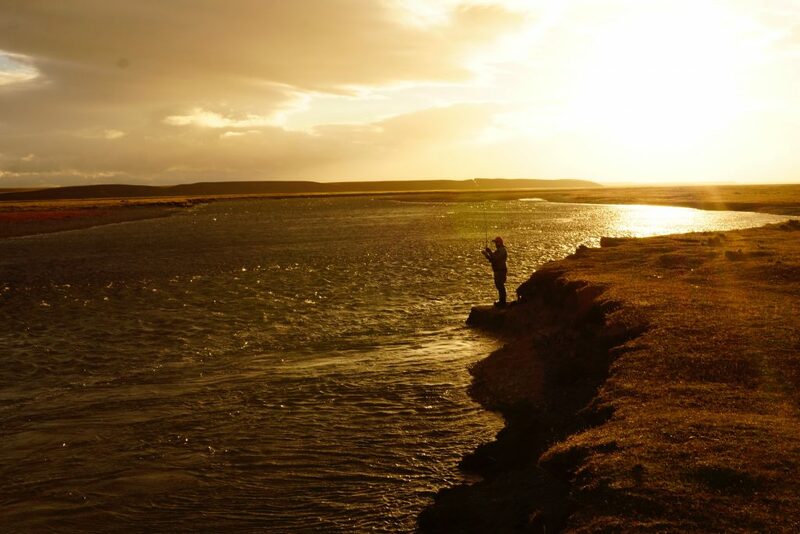 My epiphany came as the camera flashed and I was on my knees, understanding why so many dream, save and sacrifice so much to make this long pilgrimage down to Tierra Del Fuego. This is not a once in a lifetime trip. I have already made enquiries about the same week next year. 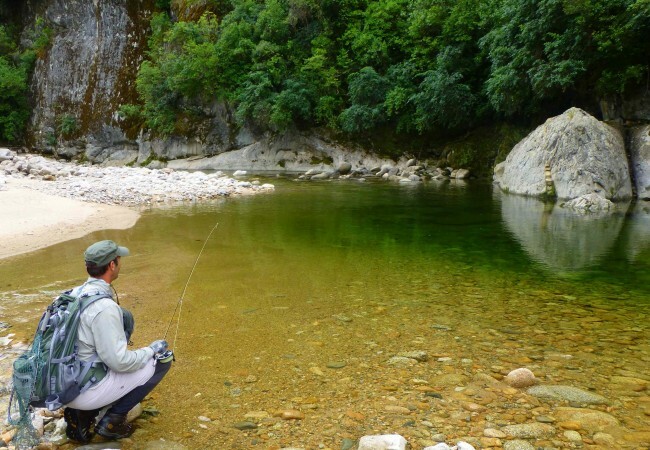 Fly choices – there are many well documented sea trout patterns that are commercially available. I fished with wooly buggers, yuk bugs, bomber patterns, EMB fly, prince nymphs, stone fly patterns. Do check the quality of the hook very carefully. Black, buggy, green and hairy with rubber legs, and have some chartreuse in the mix, hook sizes from 2-10 and different weights of fly. I tied with lead wire and tungsten beads. I bent the flies I bought, but not the ones I tied. Tippets – the fish are not line shy. I used fluorocarbon 16-20lb. The hooks bent before the line broke. If you’re fishing skinny clear water with small flies on a size 8-10 hook, then going down to 12-13lb breaking strain might be required. Lines and tips – Scandi and skagit systems with the different sinking rates of poly leaders and T14 & 17 tips. Rods – Bring a third DH rod if you can. There are rods at the lodge should you break one; I snapped my expensive rod lifting into a fish, in its second section, on the first day. My cheaper spare was reliable and took a battering from the fish I caught on it, without breaking sweat. Both rods need to be able to handle throwing out a heavy skagit line. I did bring a SH 8 weight but did not use it all week, although my fishing buddy preferred the SH rod. Reels – if you must hear the click, then make sure there is a smooth adjustable drag on the reel. It is just one less thing to worry about when a large fish is trying to empty the spool. I do not have more than 150m of backing on any of my reels. The fish do run you into the backing but even the biggest fish did not take more than 30m of line – you are fishing for seatrout, not sailfish. Just make sure your bimini twists are good and strong. Tie your own or test them if the loop is tied by a shop. Test everything – the 2 pieces of equipment that failed were the rod (brand new), and the hooks. I had tested everything else, including the tippet and hooks on fish to 30lb plus, before I left. Camera – personal choice, but wide angle shots are pretty dramatic. A small tripod might come in handy. Fishing clothing – I used a polypropylene wick next to my skin, and a short sleeve running top over it. Depending on the conditions, I would have a soft shell jacket and a puffer jacket or 2 over the top. It sound excessive, but I get cold quickly. This would all be covered by a waterproof jacket with a huge hood. A buff and beanie stops you losing heat through your neck and head. I wore a merino wool skin layer on my legs under some winter running tights, and then a fleece jogger bottom. At night I added a tracksuit bottom to ward off the chill. I have bought some insulated Patagonia nano puff trousers for next year. And then there are plenty of decent waders out there to choose from. On my feet I chose a pair of ski socks and then short merino wool hiking socks over them. Don’t forget gloves as well. If the layers are thin enough you can still move nimbly and easily, without the extra layers stiffening your responses. The sun can be intense, so slip slap slop it on to block that harmful UV on whatever exposed skin you have left on show. It is not sight fishing, but a pair of polaroids are helpful to reduce the glare, and protect your eyes from an unlucky cast.